December is a month of reflection and I, along with Patrice Cloutier and James Garrow are using our blogs to highlight interesting social media and emergency management trends from the year and note future possibilities for improvement. 2013 could be seen as a pivot point for quite a few organizations: social networking graduated from being novel and experimental, to just one of the tools in the communication’s toolbox. That being said, however, we still have a long way to go before full integration is realized throughout the response community. We’ve all seen the statistics–social networks have millions and millions of users, except Facebook which sits at 1.11 billion. A deeper look at these stats, however, can help create a more informed communication’s strategy, for instance, is this the year to get G+ and Pinterest accounts? Here are a few noteworthy stats I’ve collected from a variety of sources, along with some possible implications. Twitter boasts over 500 millions users, but one interesting note is what these users are talking about. According to Nielsen, 33% of Twitter users tweet about television shows. Implication: Why not schedule tweets that appear during shows that discuss disasters with links to information about how people can prepare–or where they could turn for help if that type of event happened in their community? If you are uncomfortable promoting a show that you did not create and have no quality control over, then simply add qualifiers, or correct misinformation, if necessary. @eValero Hi there, did you take this picture? If so, can BBC News use it with a name check to your Twitter account? The Boston Police Department understood, in the aftermath of the Marathon Bombing, that posting relevant, timely content to social media was the equivalent of an old-fashioned press release–but much more immediate. Television news organizations literally read BPD tweets to their audiences seconds after they were posted. Implication: Processes need to be in place to post content as quickly as it can be vetted. YouTube reaches more adults 18-34 than any cable network and increasingly, these consumers are watching that content on mobile devices. Youtube boasts more than one billion views a day. Implication: Get out your camera. (See Patrice’s post today on this topic, see also my post here about Missouri’s YouTube channel.) If you don’t have the resources to create your own videos, then repurpose content created by others. My absolute favorite preparedness/safety video from this year was created by State Farm Insurance with the actors from Duck Dynasty. According to Nielsen, Pinterest had a 1047% year over year change rate in the number of users, and 80% of those users are women. What are they pinning? Content relates mostly to food/ recipes and clothing. However, public agencies have made some in-roads. The CDC, which has always been a leader in social networking, has over 2000 followers on their page. Implication: If you decide to use this site, know your audience–after all, women are probably the ones getting the preparedness kit together! And lastly, Google + had a banner year and according to SearchMetrics social sharing on G+ will surpass Facebook by 2016. The power of Google itself seems to be at play here. For instance, I’ve noticed when searching news events, Google will display relevant content from G+ in an interactive sidebar. 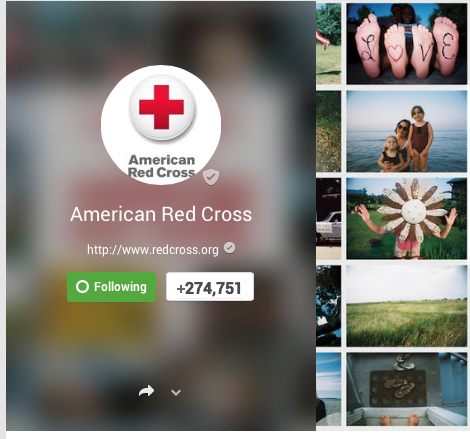 Early adopters to the platform, such as the American Red Cross, are doing well. The ARC has 274, 751 people following their page. Implication: Don’t put all your eggs in the Facebook basket! It will be interesting to see who the big winners are next year, but social networking as a whole has proven, once again, that it is not just a passing fad. Is there an interesting stat I missed? Let me know! This entry was posted in Social Media and Emergency Management and tagged American Red Cross, Boston Police Department, Duck Dynasty, Facebook, Google, Social network, Twitter, YouTube. Bookmark the permalink. Reblogged this on Cal OES Newsroom.